For a few weeks, I’ve booted around vineyards from the Rhone to Mosel, trying to get a glimpse of the art of farming, as it was practiced when it was still a spiritual enterprise. My goal is to build a future in the mountains inland from the Northeast Pacific Coast in which farming can remain an art. Some of my posts on my vineyard wanderings are documented here and here. Now it’s time for one of the most precious parts of any journey: coming home and seeing the place for the first time. And look what met me when I went out in the early morning, up in the hills. At least that’s what we called them when I was a boy and grass like this hadn’t found its way this far north yet, so it’ll do. 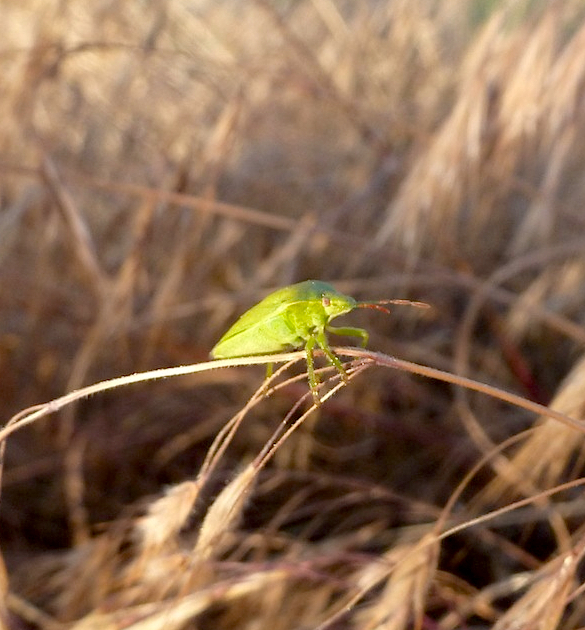 At first, I thought, hey, the cheatgrass might’ve taken over, but the bugs are still here. I was glad at the beauty of it all. Then I looked around and saw no butterflies and realized that maybe the stinkbugs won’t be here for long, either. 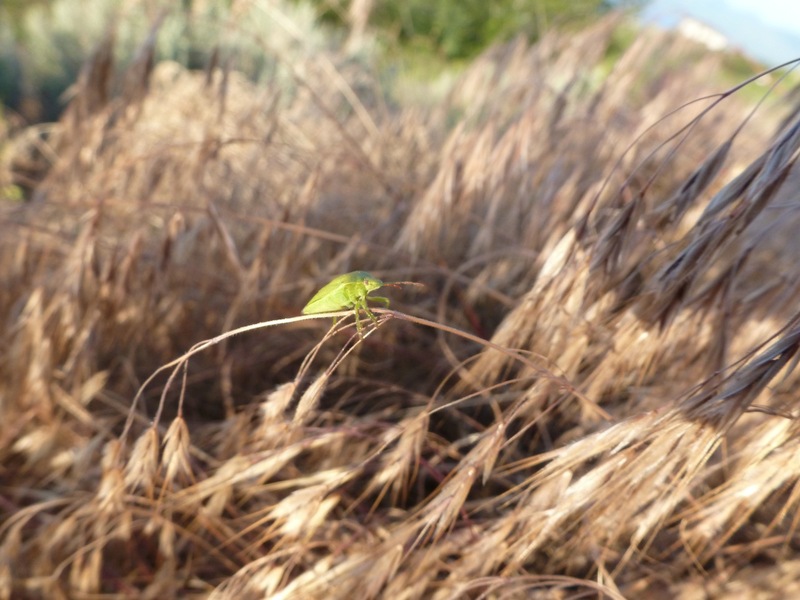 This individual is not getting anything to munch on among the razor sharp seeds and their knife-edged husks of the cheatgrass. It’s on the hunt for something better. Lots of room for stinkbugs and butterflies here. Notice how the sun made it over the edge of the gulley at last! Hurrah! No one is even asking to share space with this guys. Some of those spines are five centimetres long. You could put out an eye. 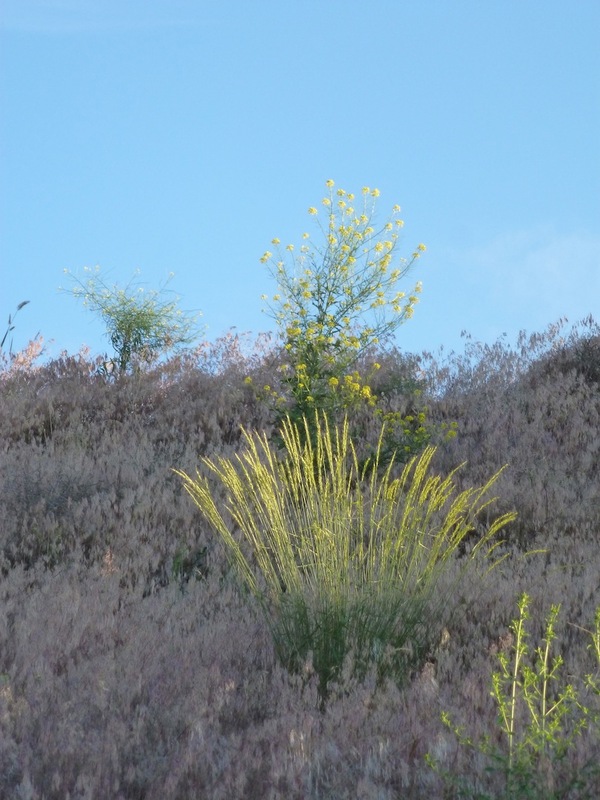 dressing the Bella Vista Hills in a vision of fruitfulness, or at least one of the pages of a botanical collector’s notebook. Not one of these plants is native here. 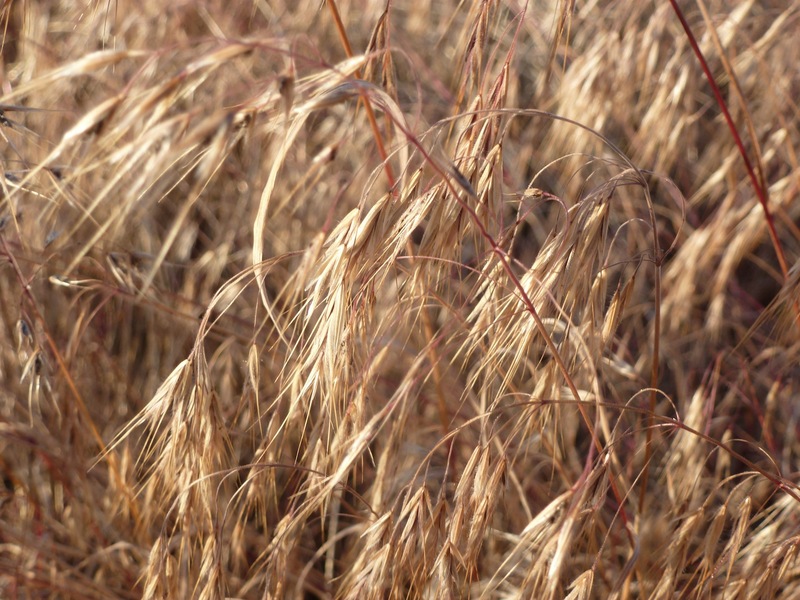 That’s how cheat grass got its name: it achieves dominance by sneaking all the water in dry climates away before any other plants can snarf it for themselves. It does this by sprouting in the fall and beginning to grow even before the snow melts from the ground. 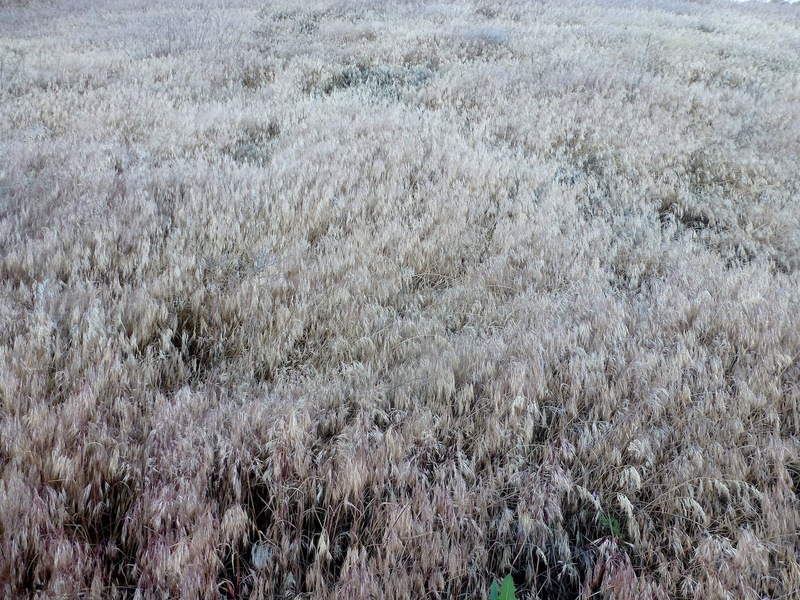 By the time native plants start growing in the spring sun, all the water has turned into cheatgrass. Maybe this year the joke’s on the joker. 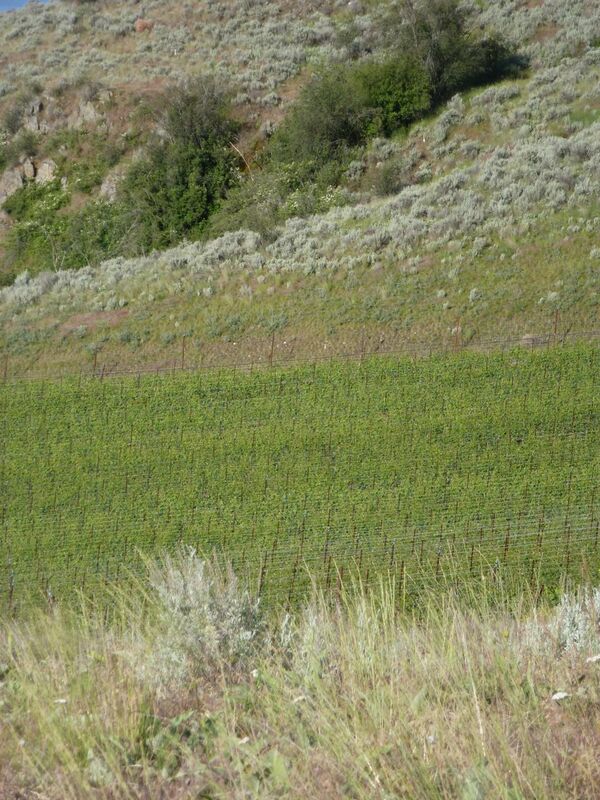 It’s been a wet spring in the Okanagan. The normally brown hills are lush — long after even invasive cheatgrass should have turned brown. In this unusual year, a few other species are able to grab some water from the cheat grass universe. 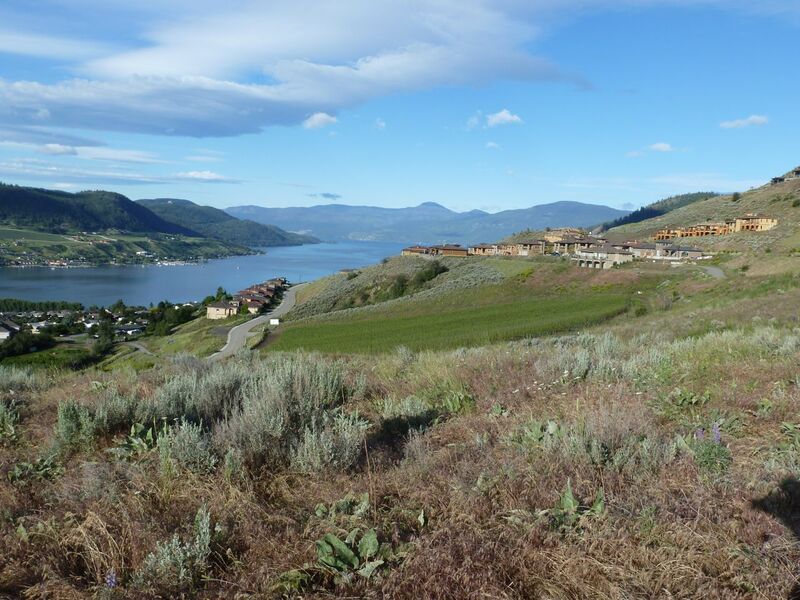 Here’s what it looks like if you turn away from the weeds and stinkbug above and look out over the community of Okanagan Landing towards the Commonage and the Okanagan Mountains, blue in the distance. 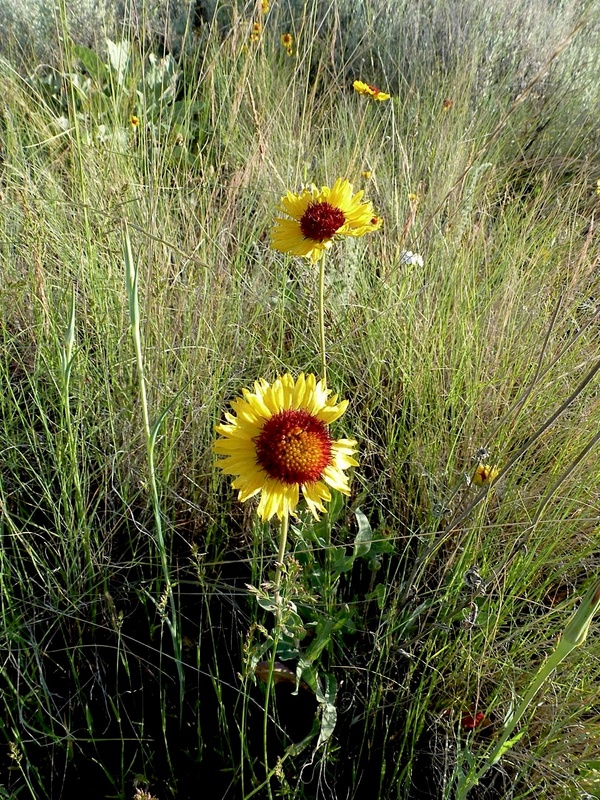 Everything you see in this image is a weed, with the exception of the sagebrush and bunchgrass in the immediate foreground, up at the 600 metre level, just up from the brown-eyed susans shown earlier in this post. Everything. Grass, houses, yellow mustard, and trees. Yes, trees. In a grassland, trees are weeds. Ironically, the trees are now protected. The grass, that was originally here, is not. Bankrupted subdivision, complete with private golf course (above), private vineyards (complete with environmental farm plan certification), and miles of roads blasted out of the rock. I’d never seen it before, but this landscape, too, is arranged like a machine. Unlike the European model, however, which works to completely transform a landscape and to efficiently harvest light and water, this machine was set up to create wilderness, and to allow human habitats and agricultural installations to have free access to areas inhabited by other species. 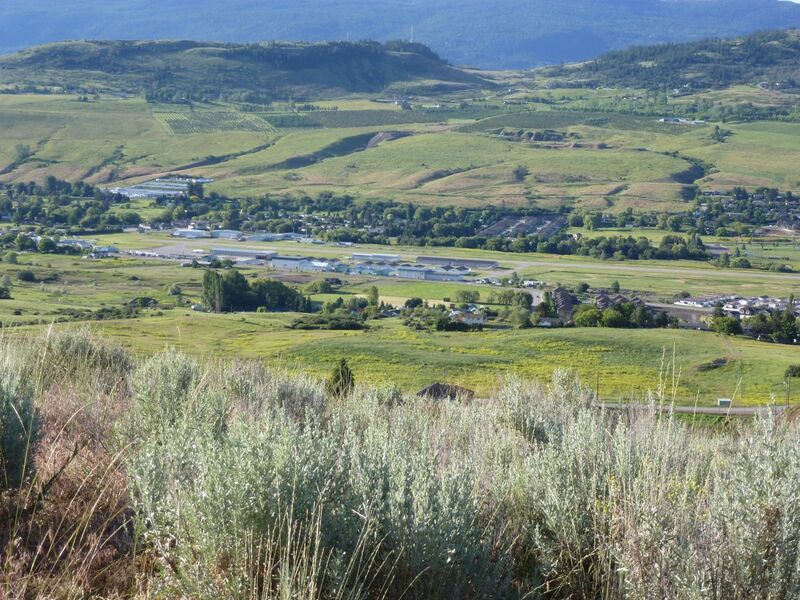 All one needs to do is to provide downward flowing channels for water (gullies), deer (sagebrush channels, moving vertically between suburbs and the higher sagebrush hills), and birds, and one is free to fill in the remaining areas with whatever one wants, in this case houses and grape plants. The idea, here in North America, is that an authentic landscape is not rooted in God, as is the idea in Europe, but in wilderness, which might be defined as a place that was here before humans and lives independently of them. Would that it were so simple. The point missing from the habitat plan is that the life of selected bands within a grassland are more linked to those areas to their sides than to those below them. By providing increased areas of exposure to imported agriculture and housing, well-intended plans for preserving habitat have actually favoured its replacement — in this case not with houses or farms, but with weeds. Ultimately, this is a story of water. Water that used to flow down off the hills and through the hills is now captured in the high country and funnelled through subdivisions and farms. The life that used to live off of that water as it slowly moved through the land, now has to hide where it can, right where the water is: among houses, in vineyards and hayfields, in orchards and tomato fields and any other place of disturbance in which those plants that seek to exploit and heal wounded land tend to gather. 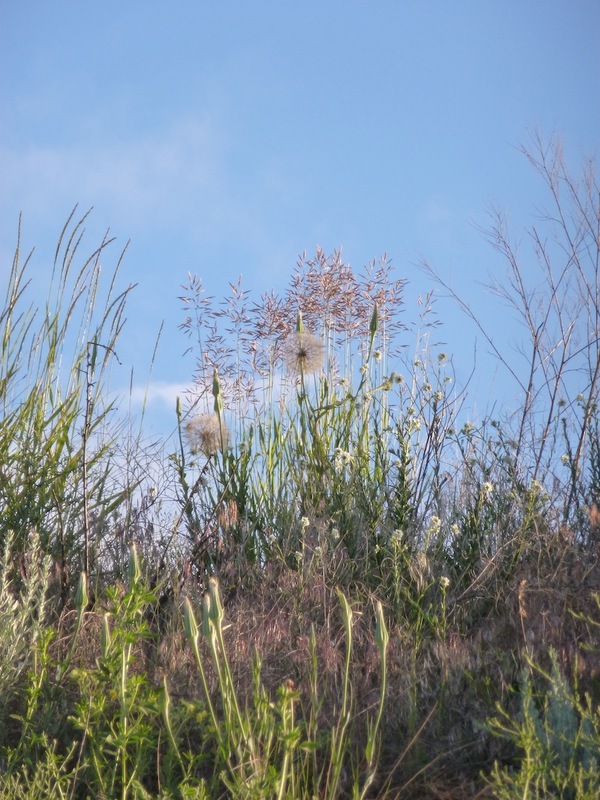 The word for these kind of plants is: weeds. …and catching a little early morning sun. Weeds are the true wilderness now. They are the creation of a water use policy based on an error. 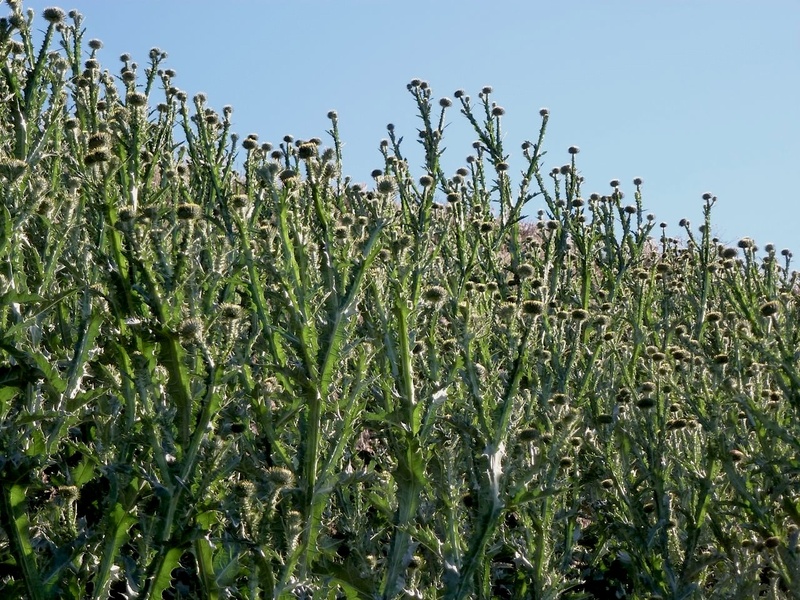 Ironically, now that so-called wild lands are protected, even wild lands with few or no remaining species, it is weeds that receive the greatest protection. Poor stinkbug. It is ironic as well, however, that in this new vertically-organized landscape, the original inhabitants of the land will only survive if they can move laterally and inhabit the vineyards. In other words, the more wild plants that can be encouraged to survive in the vineyards, and the fewer the pesticides applied in that environment, the greater the chance there is of any true wildness to survive. And that, my friends, is post 200 in this exploration. Tomorrow: Needle-and-thread grass in the sky.